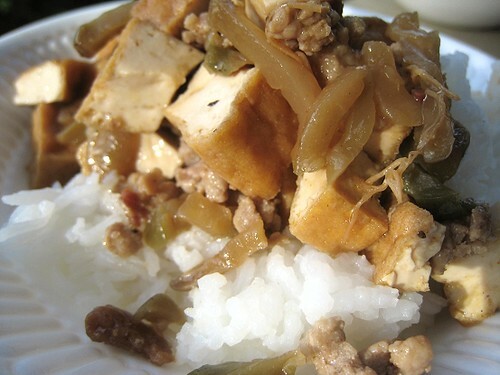 Here it is, folks, our mother's "world-famous" giniling dish. We are sharing the secrets of what has sustained us lo these many years. This is the one dish that we "kids" have never complained about having so very often: our mother has never heard, as it pertains to this dish, the annoying, whiny question of, "Giniling AGAIN?" A dish like this having a special kind of hold on us must be -- well, special. Having nourished our family for decades, our mother believes that it will nourish others. Thus, she has taught this dish to many a newlywed just starting out on the journey of life. In fact, up till about three years ago, this dish was so revered -- think cows roaming the streets of Hindu India -- that it did not even have a name. We did not even know how to call it. It was one of those newlywed "students," a young wife, who came up with the name we're using now. 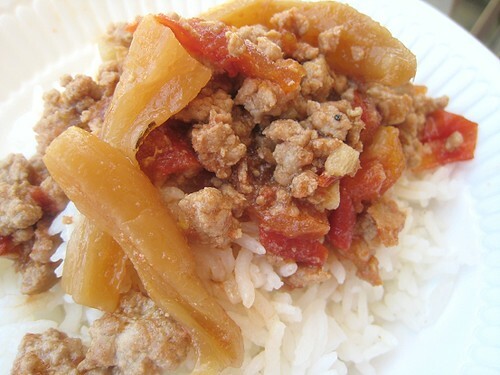 The word "giniling" actually means ground up, and in this case, it refers of course to the ground pork. This dish is very easy to do. 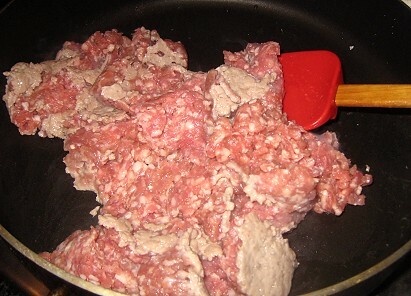 Brown 2 pounds of ground pork in a skillet. 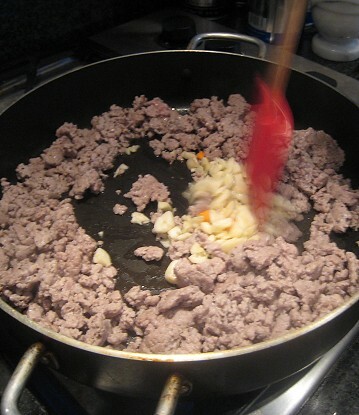 Add black pepper to flavour the ground pork. The timing of the black pepper is interesting, and I personally do not know if our mother deems that this is exactly the RIGHT time to add the pepper for maximum flavour. Add chopped garlic. Then, add 1 tablespoon of shao xing wine and 1 tablespoon of oyster sauce. 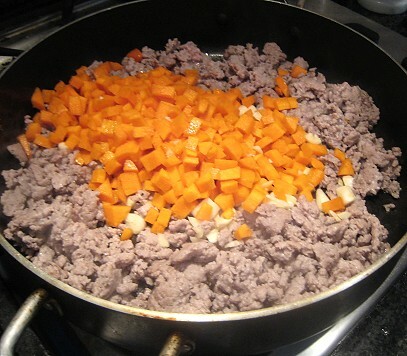 Add cubed up carrots and potatoes, about 1 cup of each. 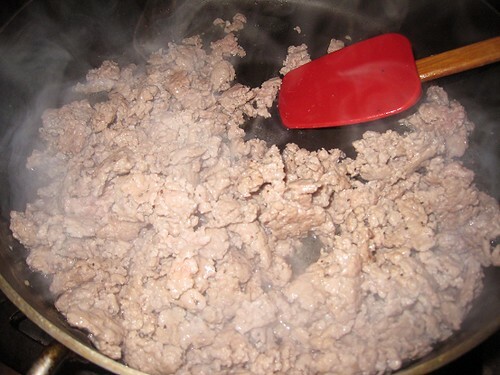 Add approximately 4 tablespoons of soy sauce and 1 cup of water. There should be enough water in the skillet so the ingredients do not burn. This dish is like a stew that it needs to simmer. Add a tablespoon of sugar. 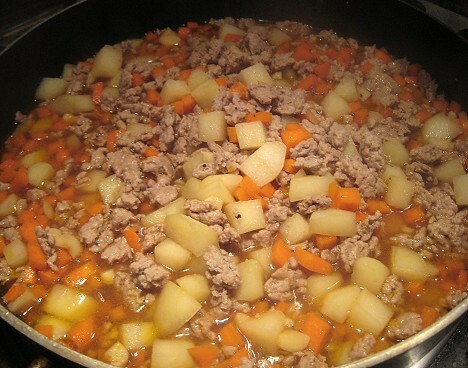 Let the mixture come up to a boil and keep on a low simmer until the carrots and potatoes are tender. Adjust the seasoning. You might need to add more soy sauce to taste. Serve over white rice and enjoy. And there you have it. This is a good dish to have in anybody's arsenal: it's tasty, it's easy, and it will not break the household budget. I can have this three times a week and not complain. Another one is Fried Tofu Puffs and Preserved Radish, without the spiciness. These giniling versions are all made the same way. It's actually amazing how different they taste merely by switching around a couple of ingredients. One ingredient that we (or at least, our mother) never use with pork is ginger, so no ginger was harmed in these dishes. 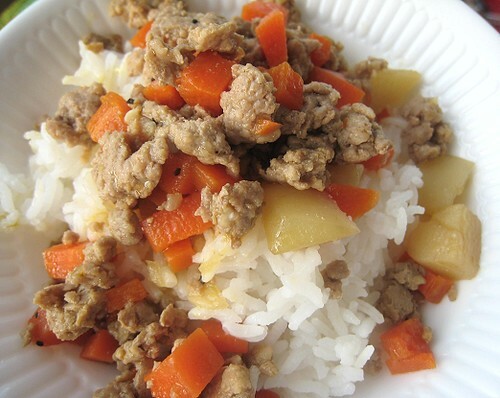 Not pairing pork with ginger is just a Chinese (or Fukien-Chinese) custom, similar to the Italian one of not pairing seafood with cheese, and the reason for this particular custom escapes me. I like all the "gourmet" versions too, but my favourite still has to be the classic giniling. 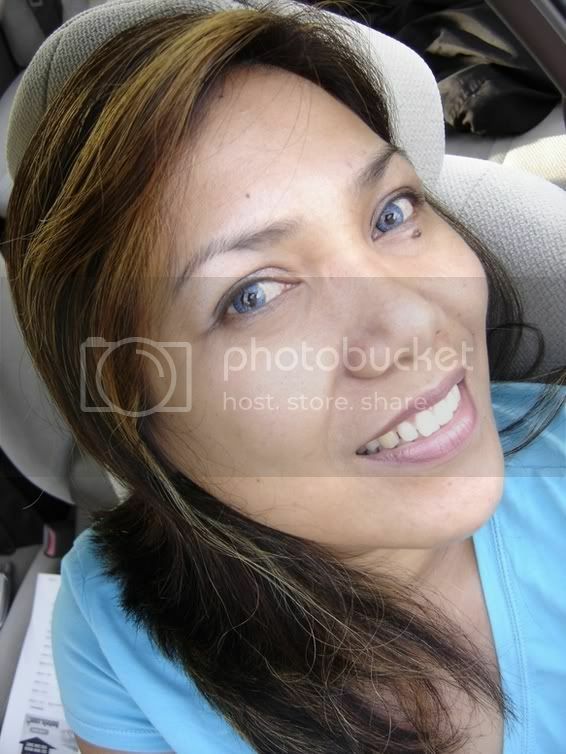 Ahhh giniling.. It brings back memories of my childhood in Binondo..
We also used to have raisins added to our giniling. The sweet and savoury seems to blend very well. Leftover giniling are cooked with eggs to make tortang giniling. Yummy for sure. I have never heard of shao xing wine can I get it in an Asian market? This dish looks very tasty and like you said kid friendly! this is my favorite..should i say..masarap!! This is really interesting. Family recipes are always the best! Mmmm, pork makes everything better - this looks great! I've almost forgotten about this dish. It's literally been more than a decade or so. I really appreciate the reminder and more importantly, the family recipe. haaha.. my mother has her own version too.. it's my fave as well. never gets tired of this dish. it brings back childhood memories, indeed. This dish is very home-cooking, so unless one grew up in a Filipino or Filipino-Chinese household, I don't think s/he would know about it! Yes, shao xing wine is available in Asian supermarkets. Ours come in a dark brown bottle with a red label. This sounds nice and easy and tasty! I've never heard of "giniling", but it sure has familiar-looking ingredients cross-culturally! beat hamburger helper any day! Just tried this. Extremely accurate recipe! 2 people and 1 whole empty pot. Thanks!